Sun Cellular giving you more reason to stay forever on their network. After they offer Facebook Zero allowing you to access FB with no data charges, they now added another favorite social site free access. 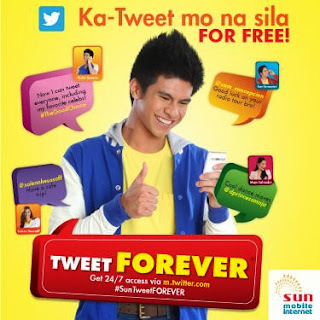 Guess what guys, Sun lets you enjoy unli Twitter for free anytime of the day as long as you’re using their network SIM and you handset is capable of receiving data (GPRS, EDGE, 3G UMTS, HSDPA). Another good thing also for this promo is that it doesn’t requires you a maintaining balance. How to register SUN Tweet Forever? No registration needed guys, all you have to do is activate Sun Cellular internet settings on your handset. In case you don’t have that settings on your mobile phone just text NET to 2300 or you can check our manual configuration details posted for reference. If everything was done right just go to your default mobile browser and key in http://m.twitter.com then wait ‘til the your browser successfully load the page. You will notice G, E, 3G, H icon appear on the upper right of your phone screen, meaning your configured your phone correctly. This promo is available nationwide to all postpaid and prepaid subscribers. Promo runs from September 18, 2013 to November 15, 2013. For more details just visit Sun Cellular. Do not use third party browsers like Opera Mini, UC Browser and more as this promo won’t work on that. For Android users, look for your internet settings at Menu>Settings>Mobile networks then look for Sun Cellular list of APN’s. For Nokia Symbian, just go to Setting>Connectivity>Destinations>Access points. Is there still any promo worth 10 pesos for unli Twitter?